The element of chance and the concept of spontaneity are what first drew Melburnian Jesse Marlow to the medium of street photography. He was captivated by Melbourne’s graffiti at the tender age of eight… with his interest in the art form just blossoming from there on. He’s worked as a freelancer, self-published books on the art and was recently selected as one of three Australians to appear in an international street photography book, Street Photography Now documenting the best of the medium from around the globe. He sat down with us to discuss his love for street photography, what his ideal project would entail and how breaking his arm led to an excellent idea. Jesse, please tell me a bit about yourself and your background. My passion for photography has been within me since I was a very small child. My first inspiration came at the age of eight, when my uncle gave me a book called Subway Art. The book chronicled the explosion of graffiti art on the New York City underground in the late 1970s and 1980s. This book triggered something in me. I borrowed my mother’s Minolta SLR camera and I began documenting the brightly coloured graffiti that began appearing on the Melbourne walls. It was the mid 1980s and my mother would drive me from wall to wall, I’d jump out of the car take a photo and hop back in so we could drive off in search of the next one. This was the beginning of my relationship with photography and the streets. For the last 12 years I’ve been a freelance photographer working for a range of editorial and commercial clients. Over this period of time my main passion with photography has been for my personal projects. I self-published a couple of books: Centre Bounce: Football From Australia’s Heart and Wounded. 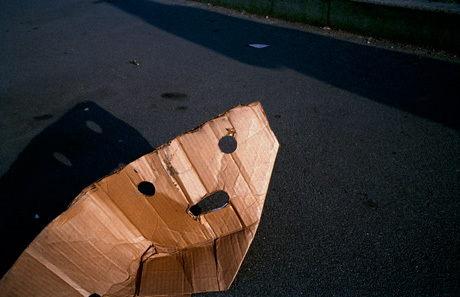 How did breaking your arm inspire your photography project ‘Wounded’? 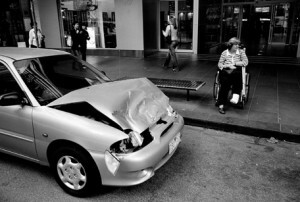 Like when you buy a new car – for the next few months all you will see out on the road is that make of car. Having my arm in a sling and unable to take photos for a couple of weeks, all I began seeing out on the street in my daily travels were people in similar situations. Seeing people go about their daily routines despite some kind of visible superficial injury inspired me and the idea quickly developed into a project. I shot a few photos to begin with but was unsure of how serious a project it was going to be. I showed some colleagues who were really supportive and encouraging of the project, which then gave me the confidence and belief to start shooting the project seriously. For the next two years, it’s all I shot when I was out on the street. It became an obsession. I was an expert at spotting someone in a crowd with a bandage or sling. The images in your ‘Don’t Just Tell Them, Show Them’ project have a completely different feel to those in ‘Wounded’. Can you explain the inspiration behind them? I felt my switch to colour instantly gave me a more precise vision. At first I responded to simplistic colour compositions, but as the body of work developed, I started looking for more graphic and complex scenes, not as easily interpreted as some my initial work. During this body of work, I’ve broadened my search for inspiration to include architecture, painting and films. The photos in my series ‘Don’t Just Tell Them, Show Them’ are a visual reaction to encounters in my daily travels. For me, it’s about searching for the unusual in the ordinary – an ambiguity that lies just below the surface. Set in the environment of everyday, this series aims to explore the banality of modern day existence through themes of abandonment, suburbia and daily rituals. In many of the photographs, suburban backdrops set the scene, with indistinct compositions deliberately challenging the viewer to ask “Am I seeing things?” I want these photos to raise more questions then answers. Compared to my previous work, this body aims to illicit a far greater interaction with the viewer. 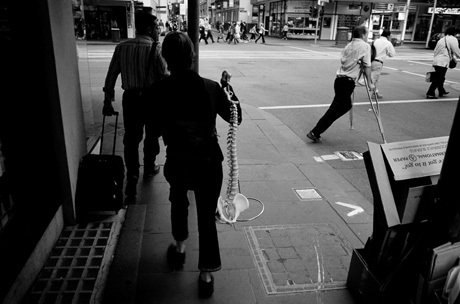 You’re one of three Australian photographers to make it into Street Photography Now. How did you get selected to appear in the book? 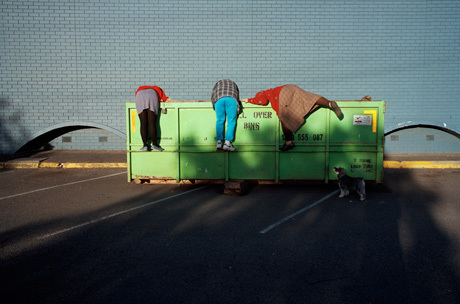 Trent Parke, Narelle Autio and myself are all part of the international street photography collective ‘In-Public’. The collective has recently celebrated its tenth anniversary. Within street photography circles it’s a very well known and respected group, so I suppose being a part of the group helped introduce my work to the authors. 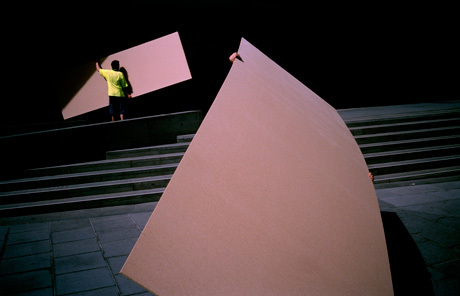 Are there any other photographers in Street Photography Now whose work you particularly admire? Too many to name… but for me to be alongside a few of my heroes is an incredibly humbling feeling. Photographers Joel Meyerowitz, Alex Webb and Christobal Hara have all been major sources of inspiration for me over the years. The book has also introduced me to a host of new photographers whose work I wasn’t familiar with. What would your ideal photography project be? That’s a tricky question as each project I’ve worked on has been the ideal project at that particular time. At the moment, with my ‘Don’t Just Tell Them, Show Them’ series I’m loving the freedom of not working on a strict theme based street project. Although I’m aiming for a very specific and stylistic look, there are no limits on the actual content of the photographs in this body of work. Contrived photo shoots and intricately designed set-ups have never interested me, rather it is the uncertainty of street photography that continues to stimulate. The idea that I can leave the house one morning and come home at the end of the day with a photo that will be with me forever constantly drives and excites me. For me it’s not about the location. It never has been. There are great photos to be taken wherever you are. The photos in my series ‘Don’t Just Tell Them, Show Them’ have been taken wherever I’ve been over the last few years… from Stockholm to Alice Springs. What is your set up? Do you work from a studio? All of my personal work is still shot on film. I still love the process of shooting film; the suspense between shooting a photo and having it processed and then viewing it on the light-box. My camera of choice is a Leica M6 with a 35mm lens. I haven’t changed lenses on that camera for four or five years. I try not to complicate things by having different lenses to choose from. I like to keep things simple so that I can react quickly to any situation. Commercially I am totally different. I shoot with a digital camera and have a nice light-filled office at home from which I work. Do you have any advice for fellow photographers wanting to make a name for themselves in the street photography arena? I’m slowly adding to my ‘Don’t Just Tell Them, Show Them’ series with a view of publishing the body of work as a book in the next 18 months. I’m also working on a non-street photography series about indigenous graffiti called ‘OAO: One And Only’ which I’m hoping to complete this year with the intention of exhibiting next year. 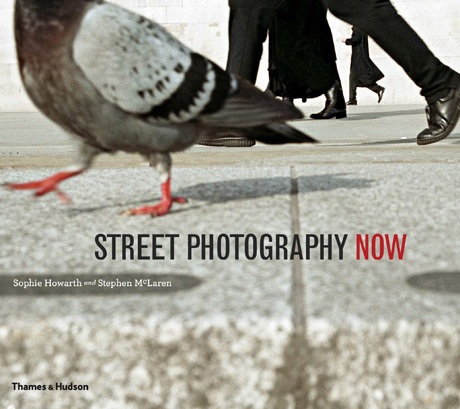 If you want to see Jesse’s work, as well as the work from street photographers from around the world then check out Street Photography Now by Sophie Howarth and Stephen McLaren published by Thames & Hudson. Really Unique………….!!!!!!! I like the collection of photographs here because they contain the things which are garbage kind of and every one ignore them. But the photographer beautifully capture these things. Keep it up dude…………!!!! !